As innovations in timber construction continue to shape the Australian skyline, the Australian Smart Skyscrapers Summit will feature discussion on timber as a construction material in high-rise structures. Timber design and production specialist, Associate Prof. Gregory Nolan is Director at the Centre for Sustainable Architecture with Wood School of Architecture and Design, University of Tasmania. Prof Nolan will appear at the Australian Smart Skyscrapers Summit to present on opportunities for timber construction systems in high-rise buildings, profiling the increased use of prefabricated timber structures in major building projects. Australia is already home to some impressive timber structures such as Melbourne’s Library at the Dock in the Docklands. Constructed primarily from Cross Laminated Timber, the project won the Sustainability Award at the 2014 Australian Timber Design Awards. Another notable example of Australian timber construction is the world’s the Forte Apartments, which held the title of the world’s tallest timber building. The 18-storey building, located in Melbourne, has since been overtaken in height by a new timber tower in Vancouver, a project by Acton Ostry Architects. At 53 meters tall, the Brock Commons Student Residence at the University of British Columbia is currently the tallest mass wood hybrid building in the world. The building design incorporates prefabricated materials with a prefabricated steel beam, Cross Laminated Timber slab panels, steel connectors and façade elements. Utilising prefabricated construction methods, the building rose at a rate of two floors per week. 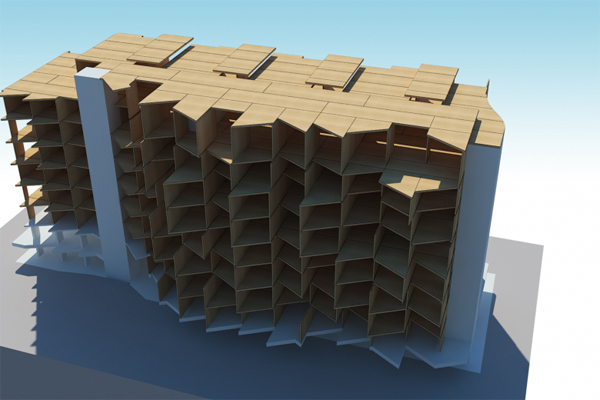 Timber construction could revolutionise skyscraper typology, says Dr Philip Oldfield, Senior Lecturer in the Faculty of the Built Environment, University of New South Wales. From an environmental perspective, the Brock Commons Student Residence timber structure demonstrates the benefits of timber construction in smart, green buildings. The development is estimated to have a carbon benefit of 2,563 tonnes through the use of carbon-trapping wood construction. “The big advantage is that timber has a far lower embodied carbon than steel or concrete,” says Dr Oldfield. Increased use of timber results in a reduced reliance on steel and concrete, which require large amounts of energy to be transformed into useable materials. However, cautions Dr Oldfield, as timber construction soars in popularity, becoming more widespread in Australia, it is imperative to ensure that forestry can handle increased demand. Beyond the obvious environmental advantages of timber, the material also presents additional benefits in terms of design and liveability. “Timber can bring a warmth and natural quality to interiors so often lacking in high-rise,” says Dr Oldfield. Timber construction is on the rise globally with plans for timber towers of up to 35-storeys in the pipeline around the world, rivalling traditional building materials with its undeniable array of environmental and cost-effective benefits. While there are many new developments and innovations in the high-rise construction arena, Dr Oldfield is most intrigued by the timber as a building material. Dr Oldfield will be appearing at the inaugural Australian Smart Skyscrapers Summit in Melbourne to discuss opportunities for rethinking Australian tall building design inspired by climate, culture and context. His presentation will explore opportunities for reinvention in tall towers, looking at how they can play a more generous role in future cities as well as accommodate innovative new functions and provide places of community and recreation in the sky. Dr Oldfield will also feature on a panel discussion regarding Regulations Impacting Height Limits for High Rise Buildings.